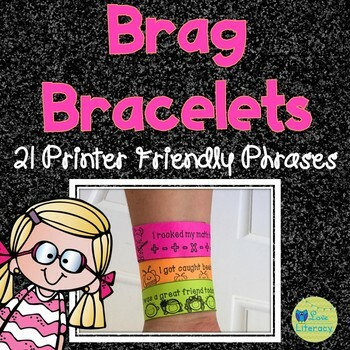 These bracelets are a quick and fun way to send a positive note home to parents. Just print, cut, and tape around students' wrists! I like to print them in black and white on colored printer paper. My students love getting rewarded with these bracelets and showing them off to others! 21 Different Phrases in both color and B&W. I had an awesome day today! Woohoo! I made my A.R. goal! I had a super day today! I got caught beein' good! I was sweet to someone! I got a 100% on my math test! I got a 100% on my reading test! I made great choices today! I was a super citizen today! Today I was a great leader! Look whoo had a good day! 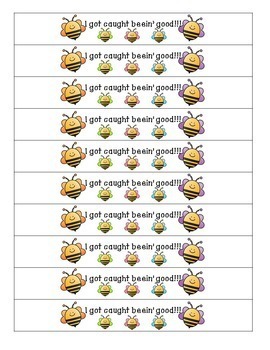 I rocked my math facts! I rocked my spelling test! 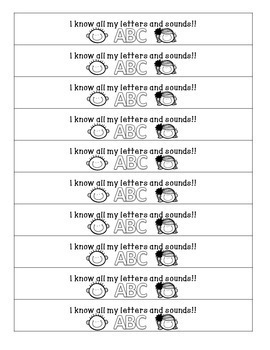 I know all my sight words! I know all my letters! I know all my letters and sounds! Today I used my best handwriting! I got a 100% on my A.R. quiz! I was a great friend today! I got caught with a tidy desk! If you are interested in buying these bracelets, but would like additional phrase, let me know! I will try to customize them for you. •	Look for the green star next to my store logo and click it to become a follower. Voila! You will now receive updates!